All Inclusive means, including: breakfast, snacks, drinks, dinner, towels, cleaning and our own chalet staff. 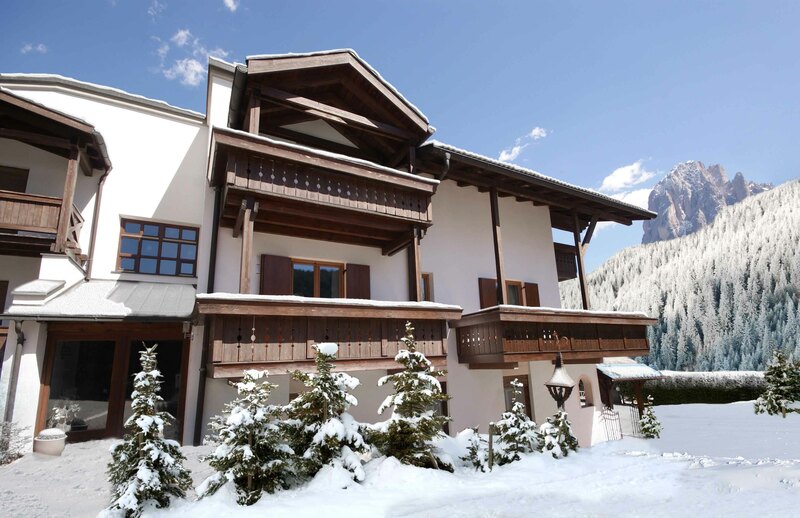 Benefiting from a fabulous location close to the ski lift right next to Selva Val Gardena, it allows direct access to the world’s largest ski area the Dolomiti Superski and the famous Sella Ronda. The free ski bus stops directly outside the chalet if you don’t like any walking. 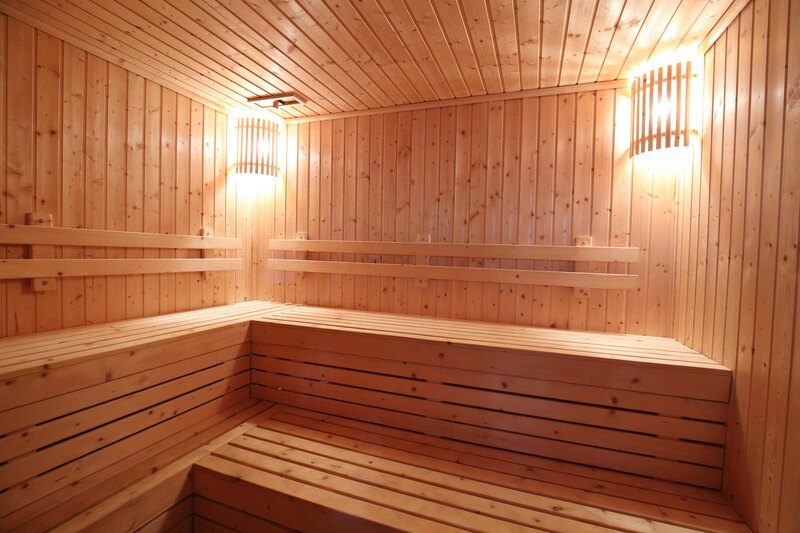 The sauna is on to help you relax after a challenging day on the snow. 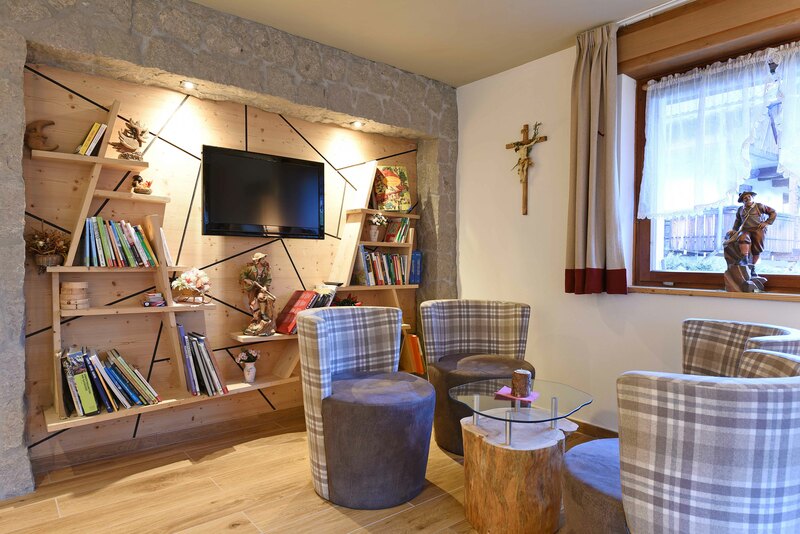 The chalet is in the very heart of Val Gardena in the authentic old part of the centre of the village of St Cristina directly next to the neighbouring Selva and enjoys stunning views over the pistes and the surrounding mountains. The accommodation is spacious and all nine bedrooms have its own full en-suite bathroom with shower or bath, WC, basin, balcony, fitted hair dryer and a new flatscreen TV. 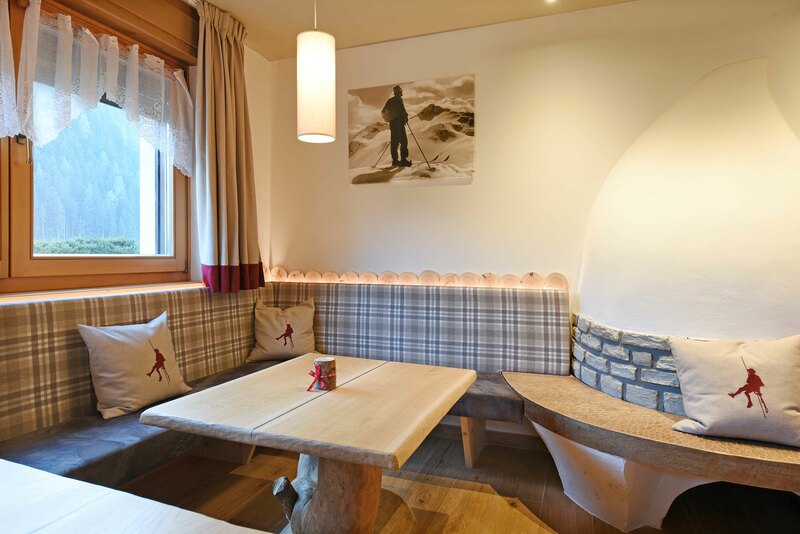 A new lounge with comfortable seating, an authentic Kachelofen and flatscreen TV. 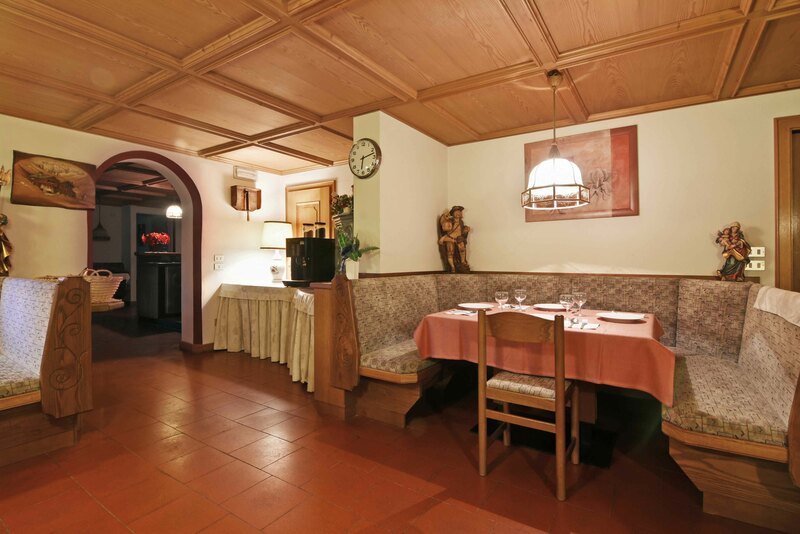 As full of traditional South Tyrolean charm as chalet Selva Panorama is, it has a separate living and dining room and offers our guests welcoming communal area. After your dinner finish off your evening with a night cap in the cosy bar. 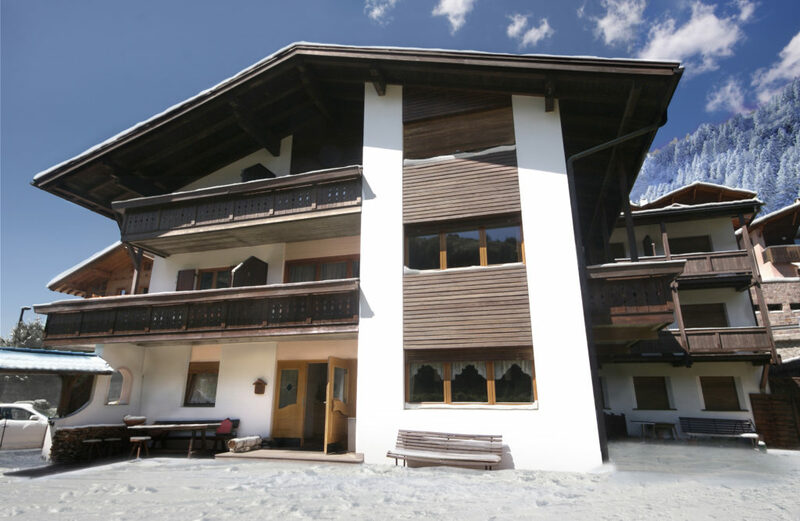 This chalet is extremely with our guests with children because of the safe winter garden and big southfacing terrace. 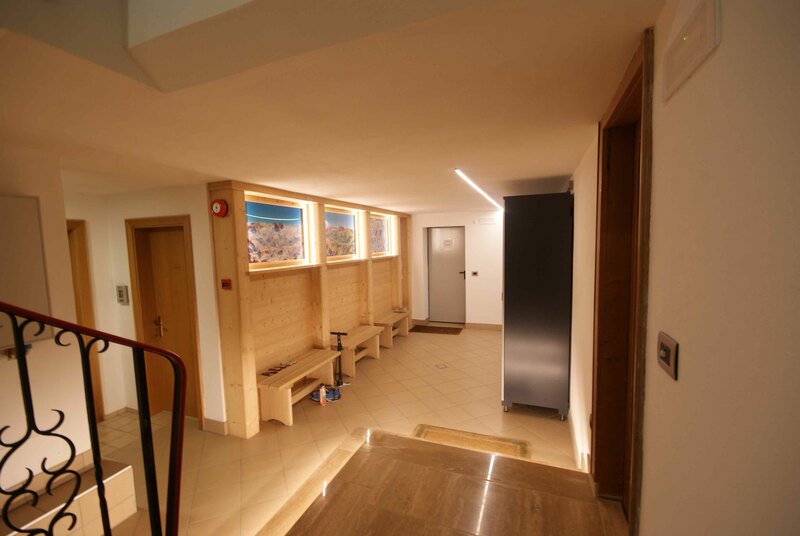 The private sauna has a spacious shower facility, WC, rest room with deckchairs, an older tanning bed and an exercise bike. 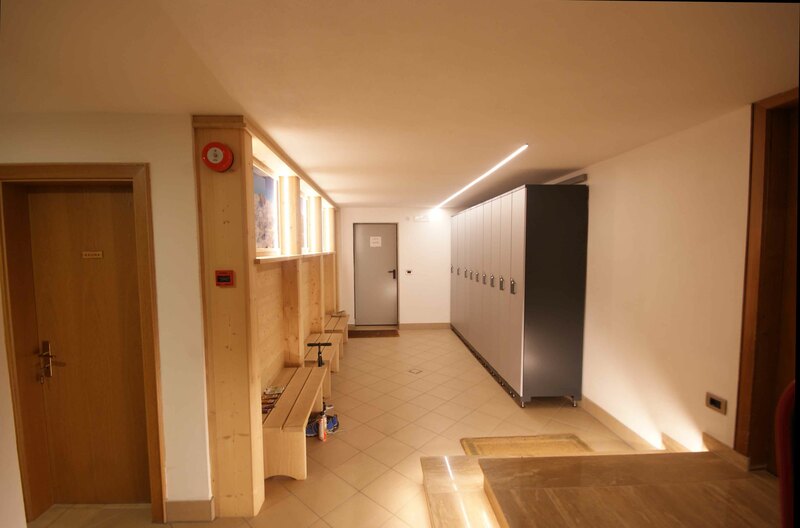 A new heated ski and boot room with ski lockers and boot dryers/warmers. If you travel by car there is a private underground parking to leave your car save and it will save you all the hassle of scraping your windows, trying to start a frozen car and digging it out after a snowfall. Our staff understand that your chalet is your own private domain and therefore will be as hands-on or discrete as you so desire. St Christina is a jewel in the crown of the dramatic Unesco protected Dolomites. 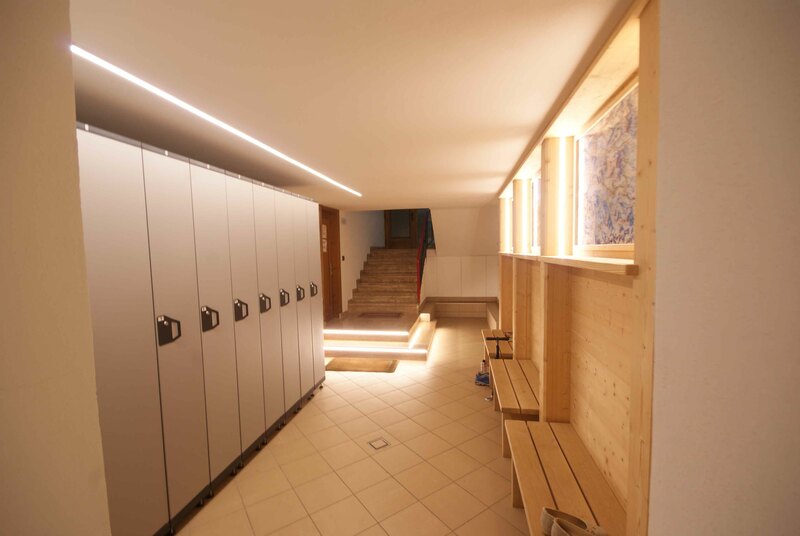 The Val Gardena resorts of St Christina, Selva and Ortisei have direct access to much of the extensive Dolomiti Superski area as well the Sella Ronda. 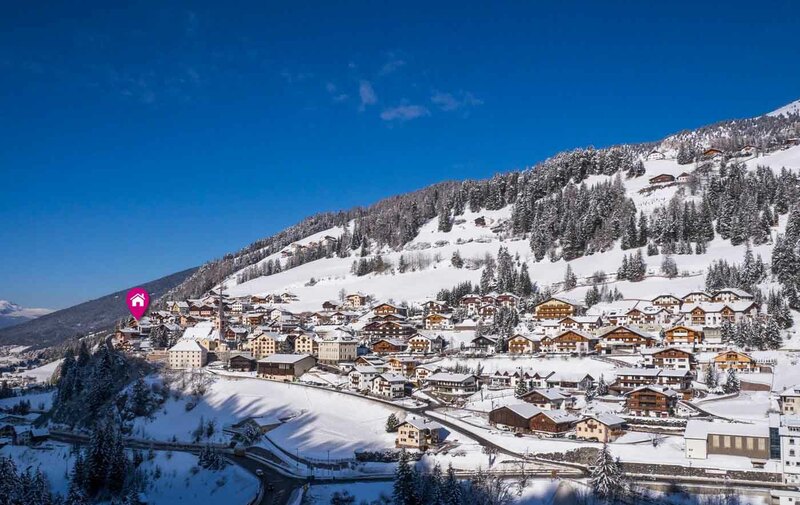 Combining Italian and Austrian traditions, Selva with it’s direct neighbour St Christina is the best known resort in the area where dedicated skiers are spoilt for choise. 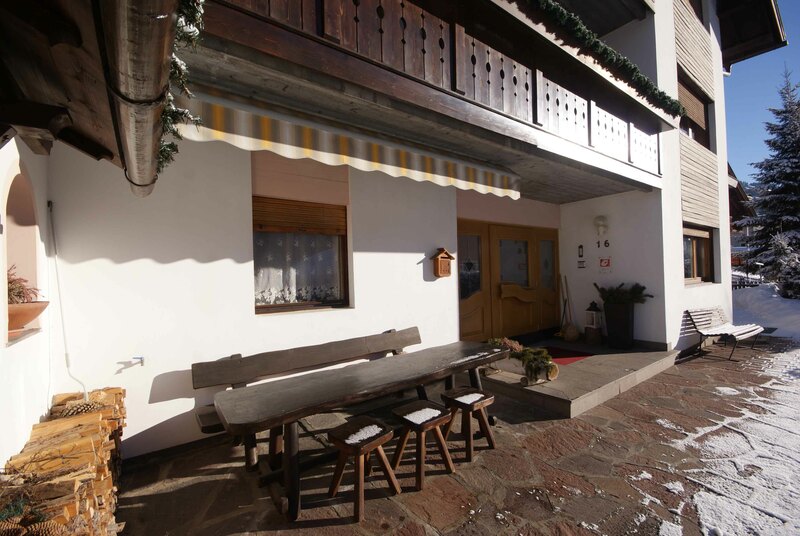 In Val Gardena, St Christina is in a spectacular setting right next to Selva. Small, smart and sophisticated, St Christina is a real find. This area of Val Gardena was for a long time part of Tyrol Austria and that’s why it has a Tirolean charm. You will hear more the german language than Italian. 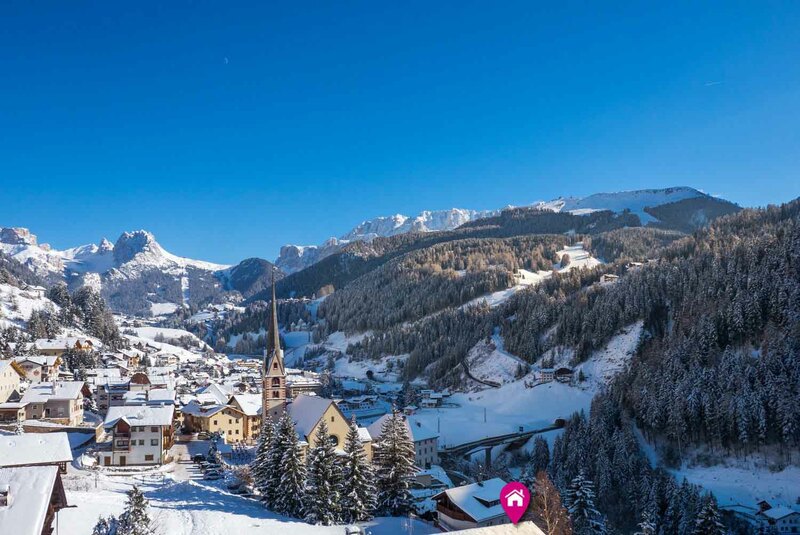 St Christina with its direct neighbour Selva enjoys the best of Italian and Austrian tradition and is a world-renowned ski area with its mountain peaks set in the spectacular Dolomite Mountains in northern Italy. These mounatins seem to have a life of their own, with dramatic high-rise pinnacles often glowing a soft pink in the early morning and a fiery red at sunset. The scenery is awe inspiring, with incredible views from every vantage point. For sheer beauty this area is hard to beat and, coupled with Selva’s own attractions and facilities, makes a wonderful choice for a ski holiday. Après-ski starts on the mounatin with several fun bars to choose from before the last runs home. In the resort itself après-ski is lively with plenty of fun to be experienced. One café on the main street serves particularly good hand made Italian ice cream. 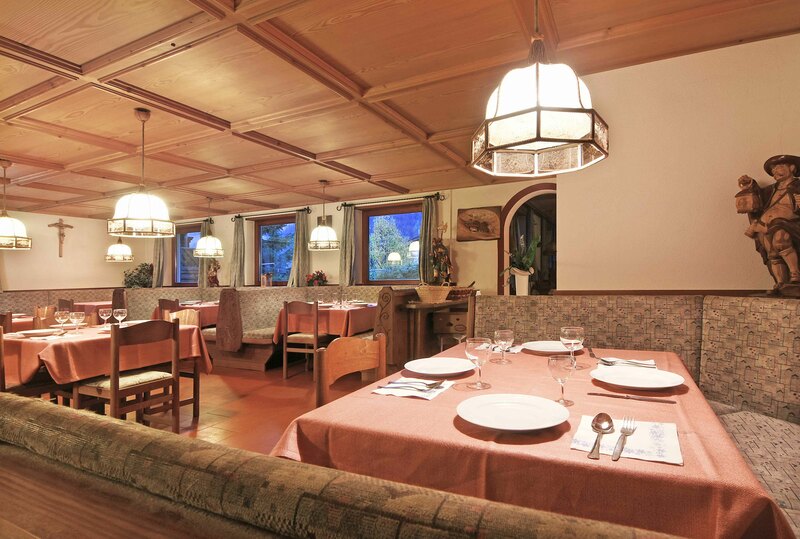 There’s a great choice of restaurants offering both Italian and Austrian specialties. There is night skiing on the Alpe di Siusi at least three nights a week that really needs to be experienced, at least once, by the family together. The mountain views from our chalet in Val Gardena are of the majestic 3181m Langkofel (in Italian the Sassolungo) where the FIS World Cup is held annually on the legendary Saslong slope. 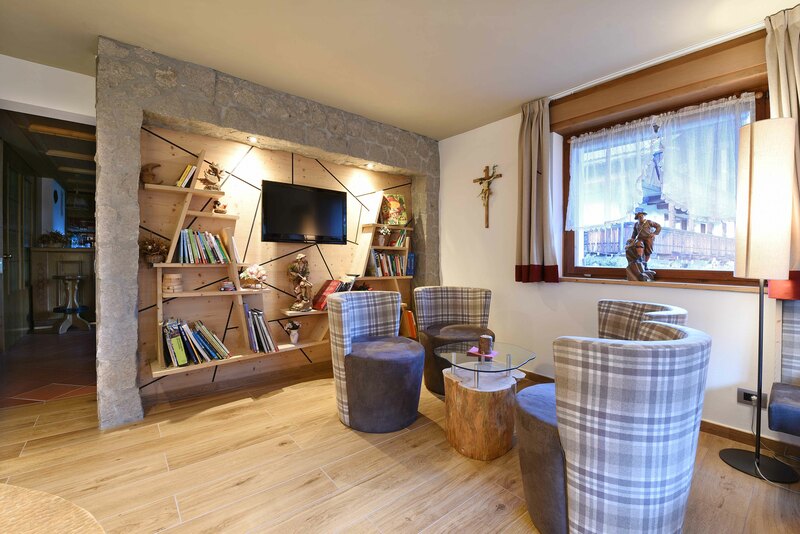 Perfect for families, the first ski lift from the chalet is connected with a children’s ski area with drag lifts and a restaurant with a big sunny terrace to enjoy your children’s first ski moments. 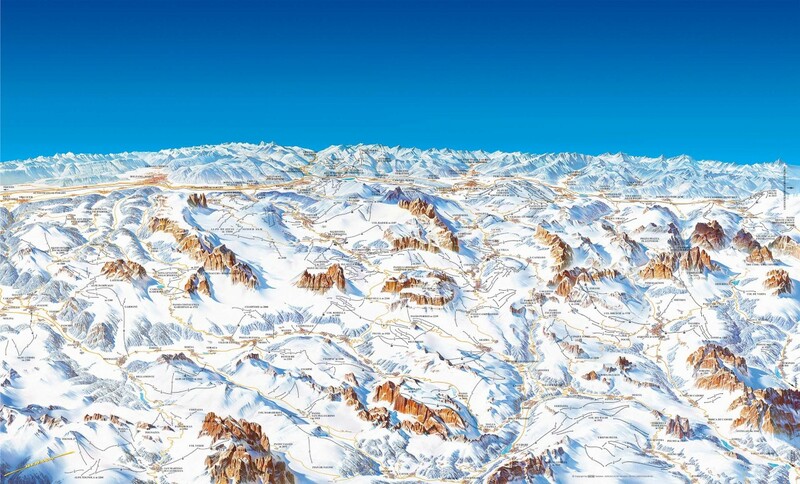 St Christina merges almost with Selva and are part of the Dolomiti Superski, the world’s largest ski network. The ski area has well-groomed and easily accessible slopes. A fantastic feature in the Dolomiti Superski area is a huge range of ski tours which guide you round a range of circuits from the sporting to the romantic, stopping at wonderfull panoramic viewpoints and mountain huts to sample the culinary specialities of the region. 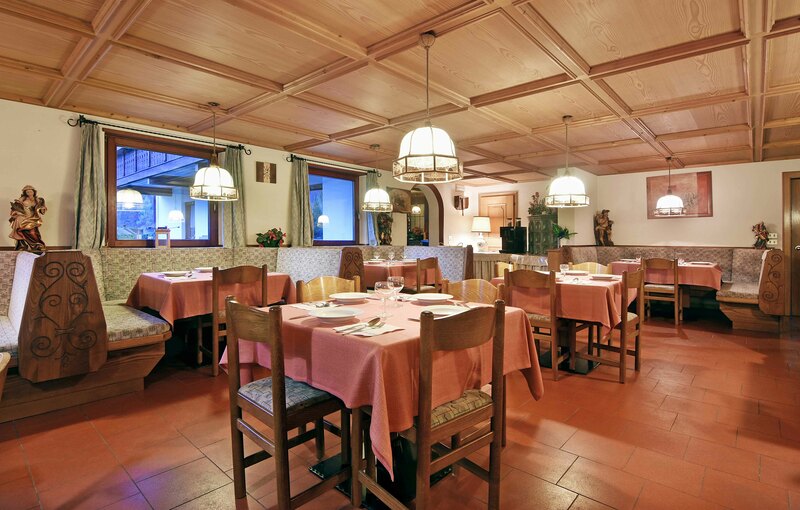 St Christina is one of the best bases to explore the magnificent region of the Sella Ronda. The famous Sella Ronda ski circuit involves four different valleys, can easily be skied in a day and is an achievable goal for early intermediate skiers. Don’t forget to ski to the Marmolade glacier. 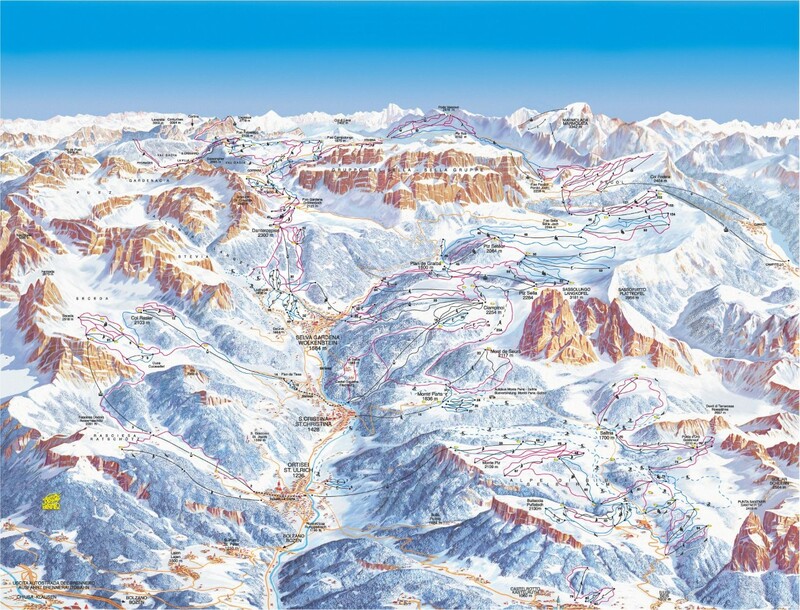 The pass of the Dolomiti Superski does not cover only the Sella Ronda, but dozens of other resorts. 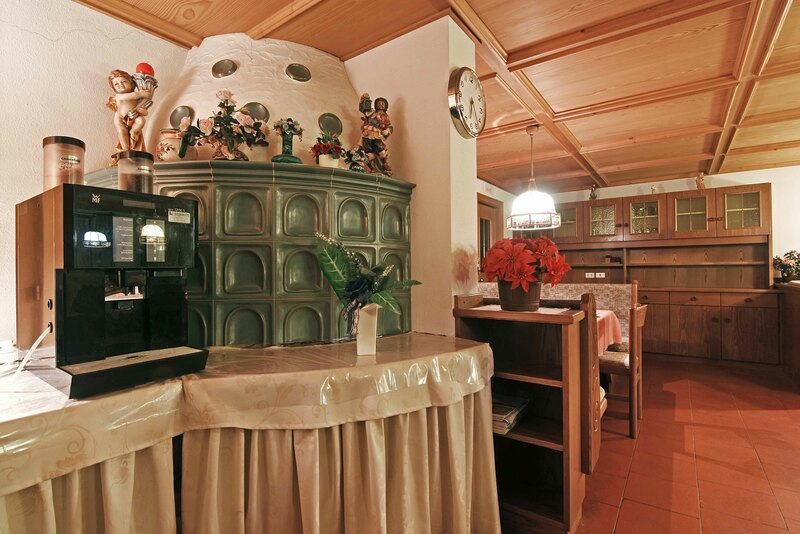 St Christina prides itself on the enthusiastic, genuine and traditionally Italian welcome it gives to families. One of the tours ‘Kinderparks’ is specifically designed for children, incorporating several obstacle and fantasy world courses and ski play areas. 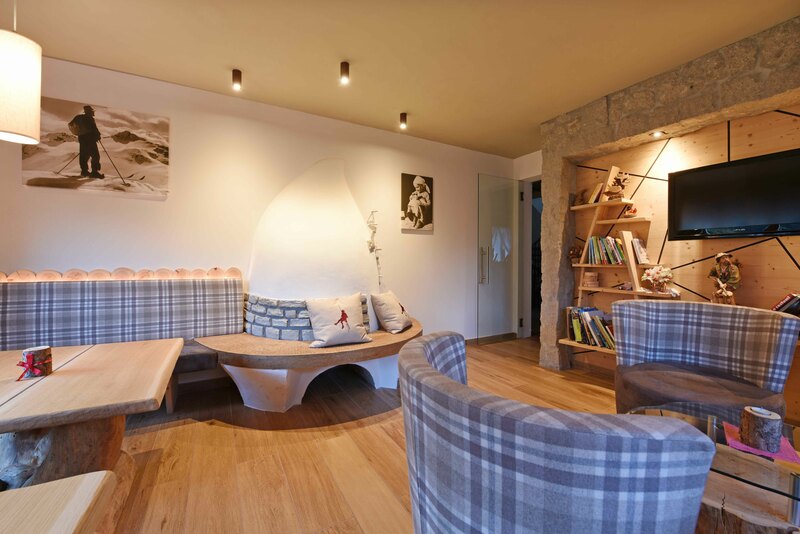 Children will feel at home here, with as much to do on as off the slopes.